The surrendering process is described here very nicely. The first qualification is that one should not be deluded by pride. Because the conditioned soul is puffed up, thinking himself the lord of material nature, it is very difficult for him to surrender unto the Supreme Personality of Godhead. One should know by the cultivation of real knowledge that he is not lord of material nature; the Supreme Personality of Godhead is the Lord. When one is free from delusion caused by pride, he can begin the process of surrender. For one who is always expecting some honor in this material world, it is not possible to surrender to the Supreme Person. Pride is due to illusion, for although one comes here, stays for a brief time and then goes away, he has the foolish notion that he is the lord of the world. He thus makes all things complicated, and he is always in trouble. The whole world moves under this impression. People are considering the land, this earth, to belong to human society, and they have divided the land under the false impression that they are the proprietors. One has to get out of this false notion that human society is the proprietor of this world. When one is freed from such a false notion, he becomes free from all the false associations caused by familial, social and national affections. These faulty associations bind one to this material world. After this stage, one has to develop spiritual knowledge. One has to cultivate knowledge of what is actually his own and what is actually not his own. And when one has an understanding of things as they are, he becomes free from all dual conceptions such as happiness and distress, pleasure and pain. He becomes full in knowledge; then it is possible for him to surrender to the Supreme Personality of Godhead. Those eligible for elevation to the transcendental position are mentioned in this verse. For those who are sinful, atheistic, foolish and deceitful, it is very difficult to transcend the duality of desire and hate. Only those who have passed their lives in practicing the regulative principles of religion, who have acted piously and who have conquered sinful reactions can accept devotional service and gradually rise to the pure knowledge of the Supreme Personality of Godhead. Then, gradually, they can meditate in trance on the Supreme Personality of Godhead. That is the process of being situated on the spiritual platform. This elevation is possible in Krishna consciousness in the association of pure devotees, for in the association of great devotees one can be delivered from delusion. It is stated in the Srimad-Bhagavatam (5.5.2) that if one actually wants to be liberated he must render service to the devotees (mahat-sevam dvaram ahur vimukteh); but one who associates with materialistic people is on the path leading to the darkest region of existence (tamo-dvaram yoshitam sangi-sangam). All the devotees of the Lord traverse this earth just to recover the conditioned souls from their delusion. The impersonalists do not know that forgetting their constitutional position as subordinate to the Supreme Lord is the greatest violation of God’s law. Unless one is reinstated in his own constitutional position, it is not possible to understand the Supreme Personality or to be fully engaged in His transcendental loving service with determination. 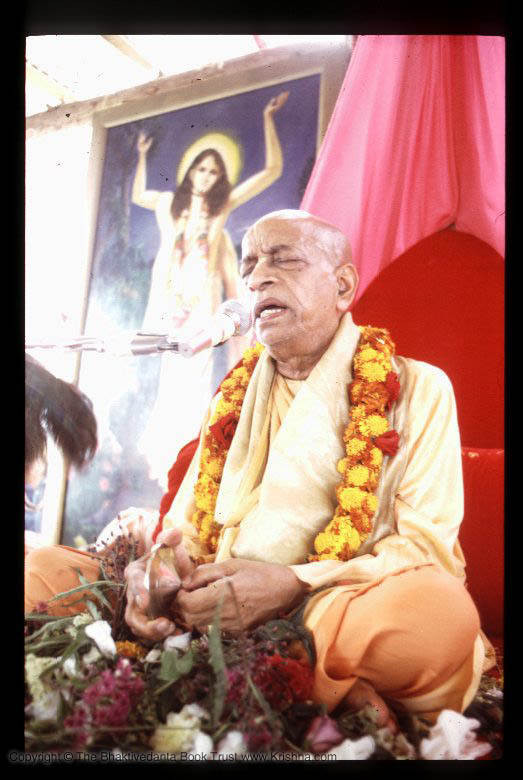 At the conclusion of Gita Jayanti, Prahladananda Swami gave a lecture on the Bhagavad Gita. A whirlwind tour of the Bhagavad Gita. Lecture by Prahladananda Swami at the home of Rupa and Gopi on Srimad Bhagavatam, Chapter 15, Text 14 on the Three Modes of Nature. One can transcend all the activities of the modes of material nature simply by understanding them properly by learning from the proper souls. The real spiritual master is Krishna, and He is imparting this spiritual knowledge to Arjuna. Similarly, it is from those who are fully in Krishna consciousness that one has to learn this science of activities in terms of the modes of nature. Otherwise, one’s life will be misdirected. By the instruction of a bona fide spiritual master, a living entity can know of his spiritual position, his material body, his senses, how he is entrapped, and how he is under the spell of the material modes of nature. He is helpless, being in the grip of these modes, but when he can see his real position, then he can attain to the transcendental platform, having the scope for spiritual life. Actually, the living entity is not the performer of different activities. He is forced to act because he is situated in a particular type of body, conducted by some particular mode of material nature. Unless one has the help of spiritual authority, he cannot understand in what position he is actually situated. With the association of a bona fide spiritual master, he can see his real position, and by such an understanding he can become fixed in full Krishna consciousness. A man in Krishna consciousness is not controlled by the spell of the material modes of nature. It has already been stated in the Seventh Chapter that one who has surrendered to Krishna is relieved from the activities of material nature. For one who is able to see things as they are, the influence of material nature gradually ceases.